* 19. 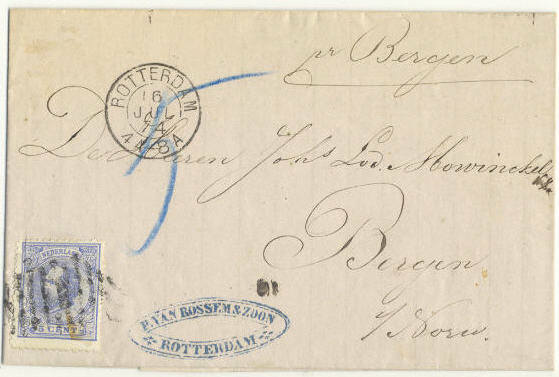 5 c King William III with numeral cancellation on cover cancelled "Amsterdam 30 apr 73" sent to Bergen, Norway. 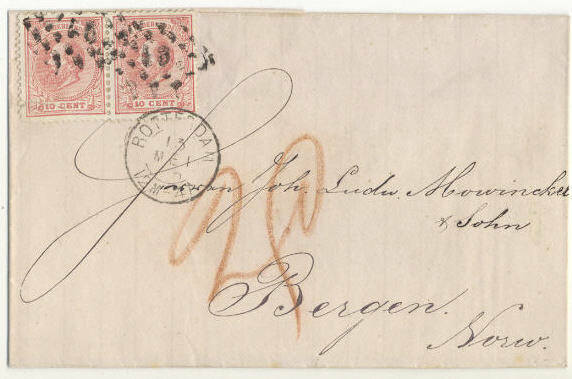 Arrival-cancellation on the back. * 19. 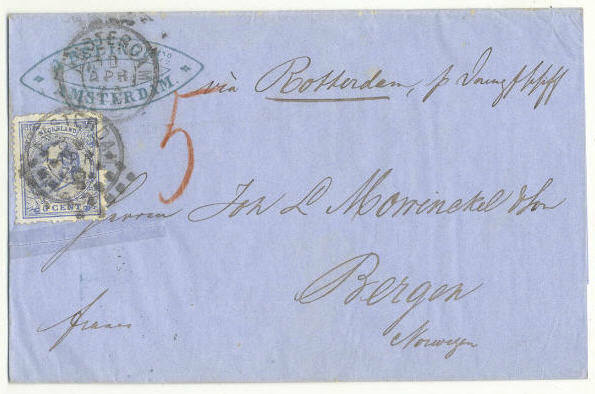 5 c King William III with grid cancellation on cover cancelled "Rotterdam 16 jul 74" sent to Bergen, Norway. * 21. 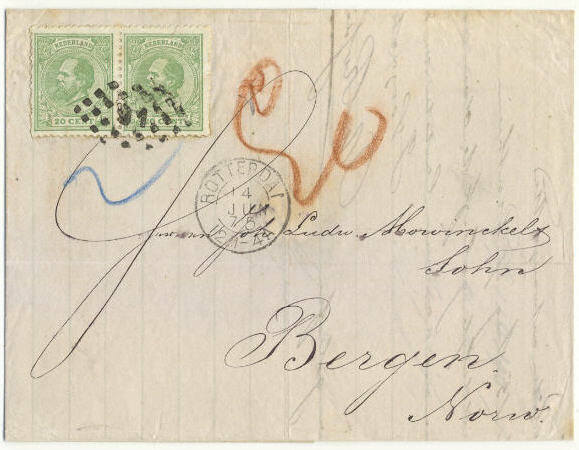 Horizontal pair 10 c King William III = 20 c - with numeral cancellation "91" on cover cancelled "Rotterdam 13 mey 75" sent to Bergen, Norway. * 21. 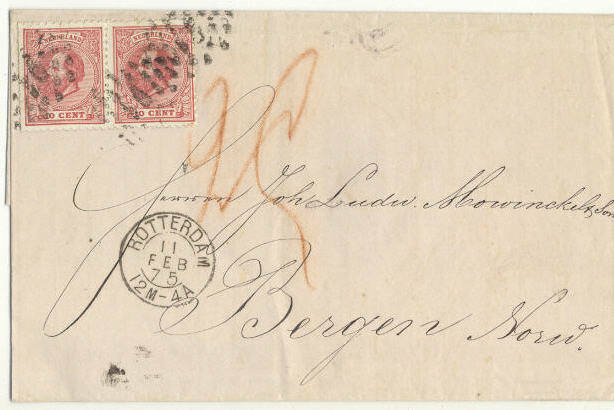 Horizontal pair 10 c King William III = 20 c - with numeral cancellation "91" on cover cancelled "Rotterdam 11 feb 75" sent to Bergen, Norway. * 22. 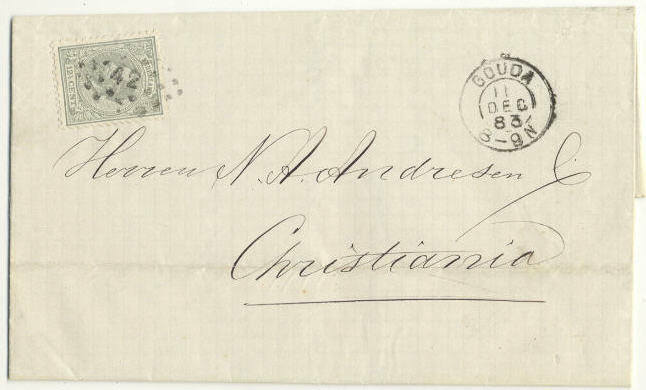 12 1/2 c King William III with numeral cancellation "42" on cover cancelled "Gouda 11 DEC 83" sent Christiania, Bergen. * 24. Horizontal pair 20 c King William III = 40 c - with numeral cancellation "91" on cover cancelled "Rotterdam 14 jun 75" sent to Bergen, Norway.